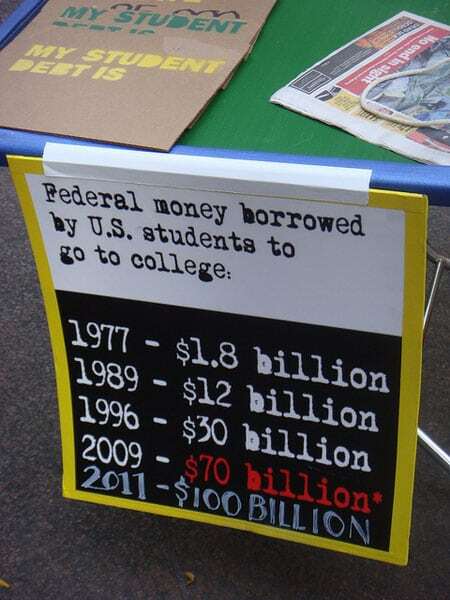 The nation’s student loan debt in 2001 was $340 billion. Today, it is $1.53 trillion. Since 2008 alone, reports Michelle Singletary in the Washington Post, the increase in debt load has been 130 percent. “Fifty-seven percent of young adults said they felt burdened by their student loans,” Singletary adds. Rising private tuition costs are frequently blamed for this increase—and certainly there is no argument that these have played a major role. But most college students attend public universities. Federal statistics show that 8.7 million of 13.7 million students at four-year colleges attend public schools, which works out to 63.5 percent of all college students (the percentage goes up to 73.5 percent if two-year degree students are included). Unfortunately, the situation for public universities is, if anything, worse than their private school counterparts, as state support of higher education has plummeted, reports James Patterson in Education Dive. “Adjusted for inflation,” Patterson writes, “state funding for higher education has fallen by more than $7 billion since 2008,” as is documented in a report from the Center on Budget and Policy Priorities, a Washington, DC-based think tank. The CBPP report, Unkept Promises: State Cuts to Higher Education Threaten Access and Equity—authored by Michael Mitchell, Michael Leachman, Kathleen Master, and Samantha Waxman—finds funding increases in only four of 50 states. Three of those states are Hawaii, Wyoming, and North Dakota. Combined, these three states have a population under three million. The fourth state, California, is the nation’s most populous, but California barely made it into positive territory with a 0.3 percent, inflation-adjusted, per-student increase, an amount that works out to a whopping $25 per student. By contrast, “The average state spent $1,502, or 16 percent, less per student in 2018 than in 2008,” according to the study’s authors. In Arizona, the decrease was a stunning 55.7 percent. Louisiana had the greatest decrease in per-pupil spending, with the state spending $4,949 per student less in 2018 in inflation-adjusted dollars than a decade before. Meanwhile, tuition has gone up in all 50 states. “Tuition increases averaging 36 percent at four-year public colleges from 2008 to 2018,” notes Patterson. The CBPP reports adds that tuition climbed more than 60 percent in seven states, more than 40 percent in 20 states, and more than 20 percent in 40 states. Is there a link between state funding decreases and tuition increases? Well, it is notable that tuition increases were particularly high in Arizona and Louisiana, where funding cuts were among the nation’s steepest. In Arizona, tuition climbed the most, by $5,355 per student, offsetting the $3,742 cut in state support. In Louisiana, the $4,773 increase was slightly less than the loss in state support.